Ticks attach to the skin and feed on blood. In most cases, a tick carrying the bacteria that can cause Lyme disease must attach and feed for at least 24 hours before the bacteria can be transmitted. Lyme disease cannot be transmitted by touching, kissing or being near an infected person. How many reported cases of Lyme disease are there in Nova Scotia? 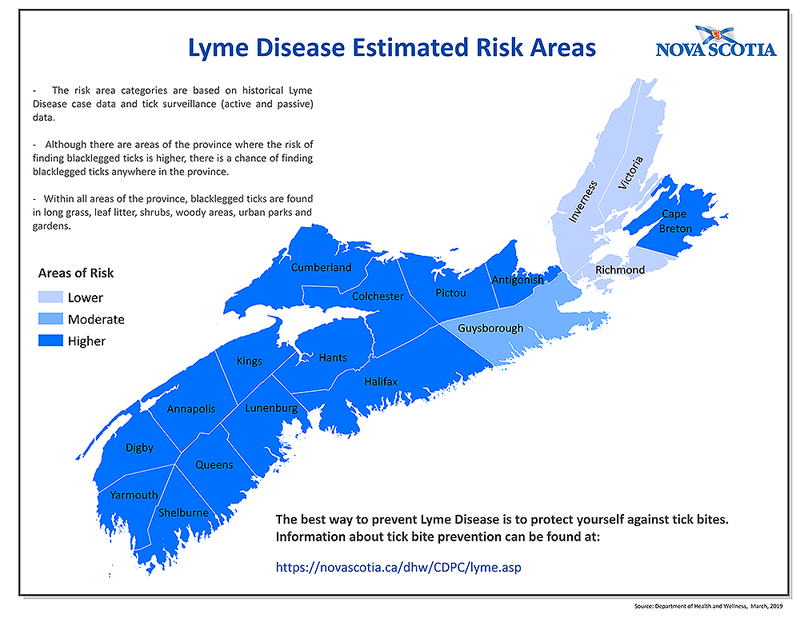 Where are the areas of risk for Lyme disease in Nova Scotia? Nova Scotia has a suitable climate for tick populations. Blacklegged ticks survive best in areas that provide a moist habitat and are often found in and near wooded or forested areas, shrubs, long grass, leaf litter, urban parks and gardens. Adult blacklegged ticks are most active in the spring and fall. They remain active until the temperature is consistently below 4°C. Larvae and nymphs are most active in the spring and summer. Black legged ticks are found throughout Nova Scotia and all areas of the province are considered as having some risk of Lyme disease. The following is a Lyme disease estimated risk areas map (and table) that uses historical Lyme disease case data and active and passive tick surveillance data to show Lyme disease risk by county. The risk area categories are based on historical Lyme disease case data and tick surveillance (active and passive) data. Although there are areas of the province where the risk of finding blacklegged ticks is higher, there is a chance of finding blacklegged ticks anywhere in the province. Within all areas of the province, blacklegged ticks are found in long grass, leaf litter, shrubs, woody areas, urban parks and gardens. How can you protect yourself from Lyme disease? Nova Scotians are encouraged to spend time outdoors, be active and remember to protect yourselves against tick bites, which is the best way to prevent Lyme disease. To access more information about simple landscaping techniques to reduce the number of blacklegged ticks around your home, please see the Landscape Management Handbook. You can learn some tips for protecting yourself and your family by watching these videos produced by the federal government in English or French, and a children’s video from the BC Centre for Disease Control below. What should you do if you think you have Lyme disease? If you have recently been in a grassy or wooded area and have symptoms suggestive of Lyme disease, especially if they include a bull’s eye rash, you should seek prompt medical attention. 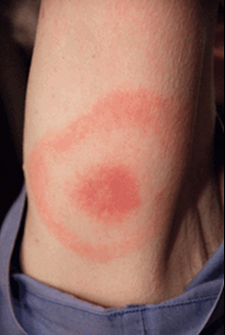 A bulls-eye rash (Erythema migrans) is a typical symptom of Lyme disease. The rash associated with Lyme disease is not always in the typical bulls-eye shape. How do you identify a blacklegged tick and where can you send it for identification and testing? This chart shows what different types of ticks look like, including dog ticks and blacklegged (deer) ticks which look similar and are both present in Nova Scotia. The image below shows a comparison between the blacklegged tick and a dog tick. Top row: nymph, male and female blacklegged ticks. 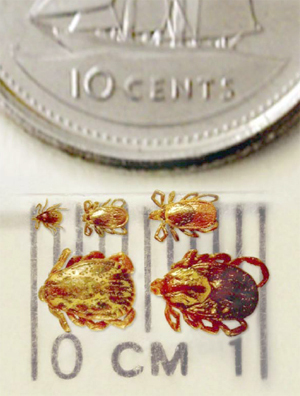 Bottom row: male and female dog ticks. The blacklegged tick does not always have black coloured legs. Dog ticks usually have white or silver coloured spots. For information regarding the federal government’s tick identification and testing program please visit this link. Note: The testing of ticks for the bacteria that causes Lyme disease should not be used for diagnosis or treatment of the disease. Where can you find more quality information on Lyme disease? Are there other tick-borne diseases? Other bacteria or viruses carried by blacklegged ticks can cause Human Granulocytic Anaplasmosis (HGA), Borrelia miyamotoi, Babesiosis, and Powassan virus disease. These bacteria and viruses have been found infrequently in ticks or small mammals in Nova Scotia and there have been two cases of Human Granulocytic Anaplasmosis in humans. These tick-borne diseases can be prevented by following the same prevention measures as described above for Lyme disease.